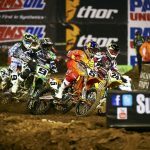 It was an excellent weekend for Honda at O.co Coliseum in Oakland, Calif., as Trey Canard captured his first 450 class AMA Supercross win since 2011 while Malcolm Stewart scored his first career win in the 250 Western Regional class. The 450 race kicked off with BTO Sports/KTM‘s Andrew Short snatching the holeshot ahead of incoming points-leader Ken Roczen on the factory Suzuki and TwoTwo Motorsports’ Chad Reed. Still on the opening lap, Reed passed Short to temporarily grab the lead. Roczen later responded with a pass of his own but misjudged the triple jump and crashed, dropping him back to last place. Canard moved up to second by lap 6, putting him on the heels of Reed, just a week after their incident at Anaheim II that saw Reed black-flagged after running Canard off the track. 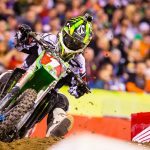 If the crowd was hoping for a long and hard-fought duel between the two of them, they were disappointed as Canard passed Reed on the following lap and pulled away for the win. Meanwhile, Reed had to contend with Ryan Dungey, fending off the Red Bull KTM rider for several laps before Dungey finally got through on Lap 16, holding on to finish second. 250 class points leader Cooper Webb looked to extend his winning streak to three races but got off to a poor start in Oakland, getting caught near the back of the pack. 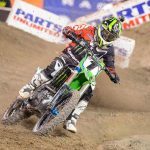 Monster Energy Kawasaki‘s Chris Alldredge took the early lead but made a mistake on a jump on Lap 3, crashing and giving up the lead to Geico Honda’s Stewart. Red Bull KTM’s Justin Hill took over the lead on Lap 4, stretching the advantage to over three seconds before crashing, giving Stewart the lead once again. This time, James Stewart‘s younger brother made it stick, leading the rest of the way for the win. Meanwhile, Webb had the difficult task of trying to make up for his bad start. Webb made it back to the top five on Lap 3 before crashing after making contact with Kawasaki’s Tyler Bowers. Webb remounted and again made his way through the field, passing Bowers on Lap 13 to move into a podium position. Webb tracked down Yamaha rider Alex Martin, passing him on the final lap to finish second. With a 15th-place finish, Roczen drops out of the championship lead with his former teammate Dungey taking over the top spot. Canard’s win, his first since April 2, 2011 in Arlington, Texas, moves him up a couple of spots to third overall. Webb’s strong recovery from a poor start and a subsequent crash kept him on top of the 250 Western Regional standings while Bowers moves into second ahead of KTM’s Jessy Nelson. 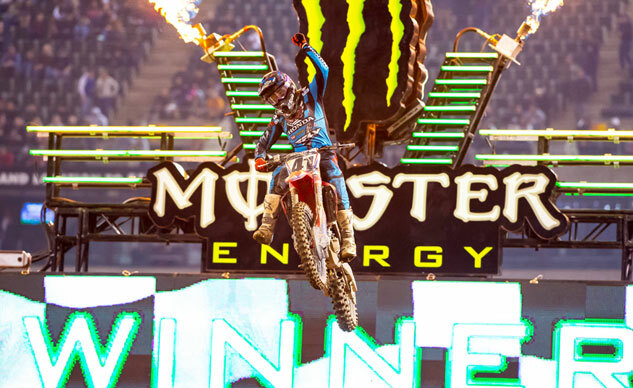 The 2015 AMA Supercross Championship goes back to Anaheim next week for the third Angel Stadium round.